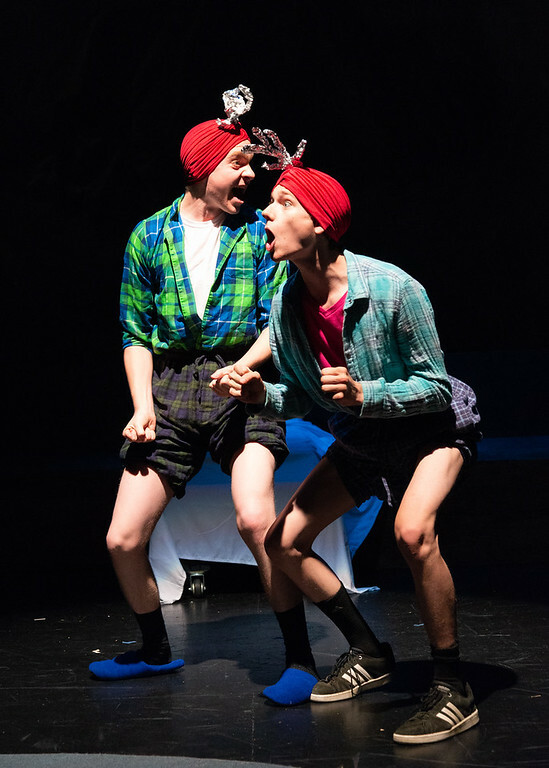 Each summer, A Theatre Near You takes an aspiring group of teen actors bent on pursuing careers in theatre or film, sometimes supplemented by a few strategically cast older actors, and presents an original work designed for the cast to experience, explore, and expand their theatrical awareness and depth. This year’s offering, Children of an Idle Brain, takes these eager thespians across the boundary between real and surreal. 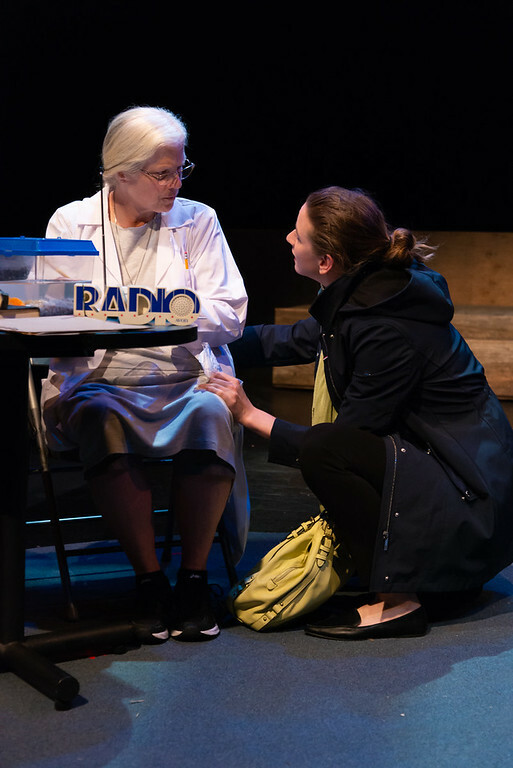 Playwright Tony Kienitz’s script begs the questions, what is reality? Are dreams real? Can one trust their perceptions? And finally, is there any crossover between one’s dreams and one’s waking life? The play follows a pair of sisters, Marily (Anna Feenstra) and Senna (Mia Trubelja). They are unfortunate because they are twice orphaned, first by their birth parents and later by their adoptive parents, the latter disappearing under questionable circumstances. The older sister, Senna, takes care of Marily, though their relationship is a tad unusual. Since being orphaned a second time, Marily spends the vast majority of her life asleep, living in her dreams. Through the story, we find that she has a history from early childhood of having predictive dreams, and Senna has learned to trust Marily’s proclamations. In fact, Senna keeps a journal of Marily’s dreams, and since their adoptive parents’ disappearance, Marily has been searching for them in her sleep. As the story begins, Marily is merely an observer while sleeping, but as time goes on, she begins interacting more with the people in her dreams. Interestingly, almost everyone in her dreams is close to her own age, something Kienitz pulled from his own experience while writing the script. Some of the interactions are fairly plausible, while others are clearly imagined. There are some clever twists in the story, as an example, the “boy park” in Marily’s dreams is delightful. In this realm, boys are loyal, loveable, playful, dog-boys. They are also quite rambunctious and even acrobatic at times. Other more absurd dream moments seem out of place (one bordering on science fiction), but most have purpose beyond the ridiculous. Although Marily generally sleeps 64 hours at a time (a duration Senna and Marily agreed upon), she is awake for short periods between her long sleep cycles. When she’s awake, she eats a modicum of food, interacts with her goldfish Rodney, and exercises briefly. She also interacts with whomever is in the house at the time. All told there are two distinct realities in play – the real world and Marily’s dream world which is very real to her. An argument could be made that Rodney’s world might constitute a third reality, but that would assume his world ended at the inner wall of his tank. How much he truly interacts with the real world outside of his tank is open to speculation, though the real world clearly interacts with him. The powerful and unexpected ending to the story at first seems a complete divergence. It appears disconnected from what came before, and is reminiscent of O. Henry in its surprise quality. 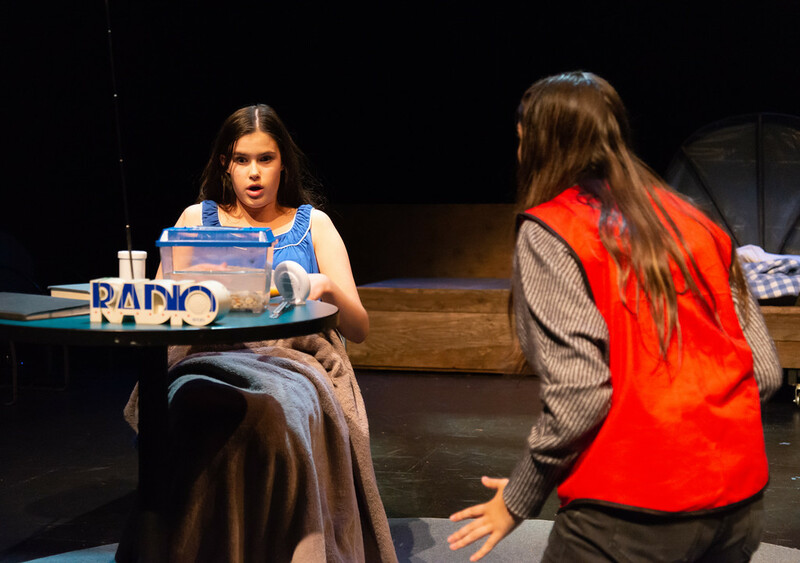 On the other hand, it sparks discussion and further reflection from audience and cast members alike which is a high compliment for any theatrical production. Tori Castro’s sound design helps enhance the mood nicely. In the dream world, music is always playing in the background reminiscent of a scene in a Georges Seurat painting. The husband and wife team of Tony Kienitz and Tanna Herr co-direct this production. Their youthful cast abounds with exuberance and wonder. The cast members range in age from 14-21, save for one cast member this year who is pushing 60. Beyond Feenstra and Trubelja, the cast includes: Lauren Emo, Monica Hobbs, Cayden Kendall, Emily Liberatore, Holly Liberatore, Daniel Lindstrom, Elizabeth McCole, Zoe McCrea, Austin Nipper, Alyssa Rojas, Antonio Rojas, Quincy Shaindlin, Sophie Sonntag, Robert Vetter, Gil Weissman, and Jackson Wylder. Feenstra and Trubelja are credible strained sisters. Their characters have a secret that they carefully protect, making it clear from the start that there’s more than meets the eye with these two. 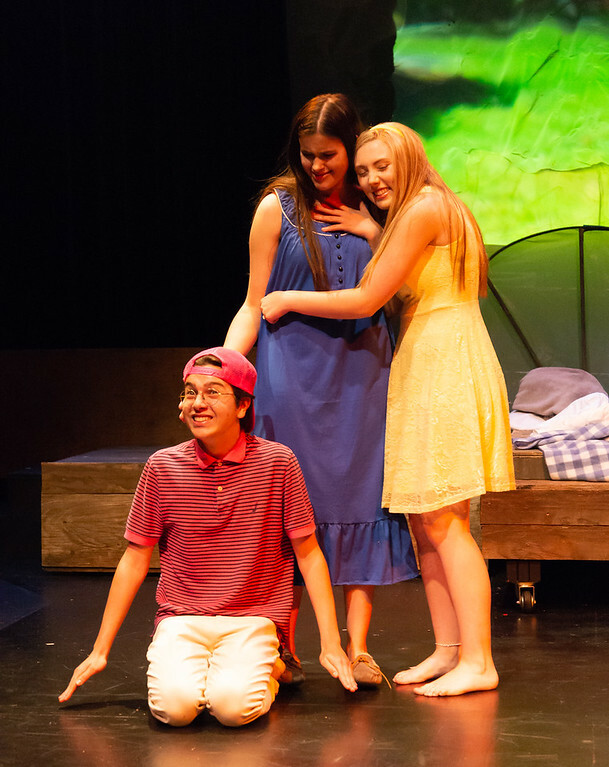 They both also have some wonderful solo scenes that work extremely well such as Marily’s amusing “awake” routine, and Senna’s university theatre program audition which is riveting. Antonio Rojas is adorable as Bromus, one of the pet boys at the boy park. He has the affect of a lazy dog relaxing in the sun down perfectly. He later slyly leans on his owner as she absentmindedly scratches his head. Robert Vetter and Lauren Emo play well together as Senna’s friends and workmates, Cale and Cam. Cam is called upon to watch Marily the weekend that Senna travels out of town for her audition. Cam brings Cale with her to the house that weekend, and their discovery is a turning point in the story. They display just the right gravitas for what they uncover. A later confrontation with Marily is both informative, and a little terrifying. Marily’s closest dream allies are notable. Hobbs is touching as Maize who is part confidant, and part guide. These facets and more come across well. Gil Weissman’s Buddy (Marily’s pet boy in her dreams) is a bit overstated. His comportment and verbiage are on target and are consistent with the other dog-boys, but his dialogue delivery is more forced. 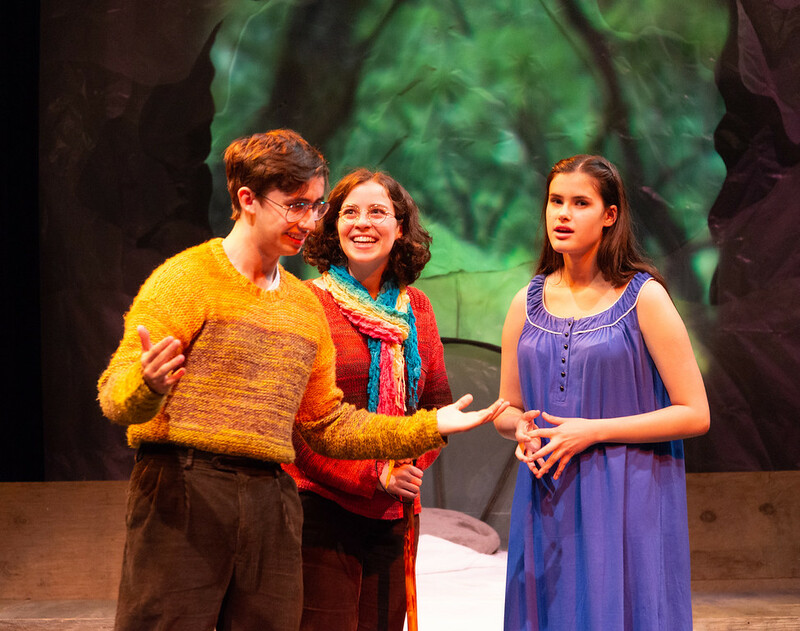 Wylder and Emily Liberatore as Marily’s parents are touching, and they show a great depth of feeling even though their scenes are fairly brief. Holly Liberatore’s Dr. Ma is a crucial character that has to be played by an older actor. While expert aging makeup on a younger actor could conceivably convey the correct visual, it would be extremely difficult to achieve in such an intimate performance space. Also, Liberatore’s life experience and delivery would be hard to match. There are several other standout scenes and performances throughout the play though detailing them all would detract from the audience’s discovery. The set is simple as the space demands. A platform occupies the upstage area which signifies the attic that Marily sleeps in. Her bed is at the center of the platform. The bed is pulled slightly downstage, the upstage curtain opens, and slightly surreal scenes are projected upstage when Marily enters her dreams. During the real world scenes, there’s a table, floor lamp, and a single folding chair downstage. A small tank holding a live goldfish is on the table. The story bounces between realities quickly, and while the lighting, music, and set transformations effectively clue the audience in to where they are, the transitions take too long. While it would be more effective if the stage could be partitioned into areas for each reality using lighting to shift focus, the performance space isn’t large enough to accommodate that given the active action requirements. Instead, the bulk of the cast is involved in quickly moving the downstage furniture in and out of the space as the location requires. This rapid movement of the table endangers the live goldfish, potentially sending it crashing into the walls of the tank. The audience also has too much dead time while the actors frantically execute their table movement choreography during the blackouts. When shifting into Marily’s dreams, the music plays, but coming the other way, outside of the sound of feet scurrying as the furniture is rushed back onto the stage, there is silence. While this production enjoyed a very smooth tech week, opening night was not so fortunate. The house lights dimmed, and nothing happened initially. It took two resets and some help from the professional staff before the show could begin, but once the show got started, the technical aspects worked well. While the target audience is similar in age to the bulk of the cast, the story will appeal to adults as well. This piece is an exploration of perception and presentation, and it’s worth a look. Update: With regard to the set change comment regarding silence outside of the sounds of feet scurrying, that’s not quite accurate. In the real life segments, there is the sound of omnipresent rain falling though it is easy to start to tune that out after a little while. See: A Theatre Near U for more information about ATNU and see MVCPA/Children of an Idle Brain to order tickets.